Keller Grundbau Ges.mbH have been subcontracted by Austrian Federal Railways to undertake special ground engineering works for the project Austrian Federal Railways Koralmbahn section 60.3. A joint venture consisting of the locally based company Kostmann Ltd. and the tunneling specialists Baresel Ltd. from Stuttgart, Germany, was chosen from the Austrian Federal Railways (ÖBB) to execute the project. Keller Grundbau was awarded with the special ground engineering works with a contract value of approximately € 32 million, the largest contract in the history of Keller in Austria. Overall, the order contains approximately 58,000m cased piles with a diameter of 880 or 1,180mm and 74,000m Soilcrete® columns. Anchors, nails and shotcrete are also part of the construction. 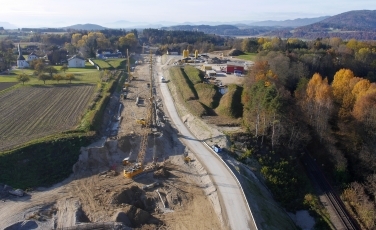 The tunnel chain in St. Kanzian (Carinthia, Austria) with the two tunnel sections between Srejach and Untersammelsdorf is said to be the biggest construction challenge of the Koralmbahn-project in Carinthia. The special geological conditions in this area are the reason for the complexity of the construction works. Silty Stillwater sediments, so-called “lacustrine clays”, dominate in many areas of the tunnel run. These postglacial fine sediments are accordingly carried out in the course of the tender soil testing silts and silt clays, with a variable proportion of sand. Characteristics of these soils are fine to medium sand liners that occur lamellar in the soils. The consistency of these soils is very different; they may be from soft to semi-solid in situ. To a lesser extent, sand dominated sediments are found in dense storage. The construction works began in March 2015 and will run until the beginning of 2018.